Beets are a Super Food! Learn More & Try a Delish Recipe! Home » Blog » Beets are a Super Food! Learn More & Try a Delish Recipe! Beets keep popping up everywhere we look. They can be found topping salads, mixed into vegetable juice, and even as chips. It is impossible to ignore their deep rich purple color, which is one of their main attractors, but what is it about them that makes them a super food? The rich color comes from a combination of compounds: betacyanin, betaxanthins, and betanin. These compounds are known to be strong antioxidants, and help our bodies neutralize free radicals. Free radicals naturally occur in our bodies and build up over time; research has found that the gradual accumulation of free radicals is what contributes to the aging process, heart disease and even cancer. slow or inhibit the growth of tumor cells. Drinking beetroot juice regularly has been shown to decrease systolic blood pressure and improve the body’s ability to use oxygen during cardiovascular exercise. They are also mineral and nutrient rich. Beets are a source of folate, which has been shown to lower the risk of heart disease and protect against birth defects in pregnant women. Folate acts as a methyl donor in our bodies, it aids in improving liver function, detoxification, and cellular function. Betaine, which is found in beets, acts similarly to folate. Methyl donors, like folate and betaine, act by methylating homocystine to methionine and increases the levels of S-adenosylmethione (SAMe) in our system. SAMe plays many important roles in our bodies, such as supporting our immune system, maintaining healthy cell membranes, and can even relieve pain associated with osteoarthritis. When homocystine levels are elevated it puts the body at an increased risk of developing atherosclerosis, heart attack and stroke. Beetroots are also a source of manganese, potassium, copper, magnesium, phosphorus, iron, vitamin C, vitamin B6, and fiber. Beets are also beneficial for the liver, acting to protect and improve hepatic function. Betalain, a type of phytonutrient unique to beets, helps form gluthione and supports phase 2 detox by neutralizing toxins and allowing them to be passed through urine. Detoxification primarily takes place in the liver and is how our body processes and eliminates drugs, hormones, toxins, heavy metals and other chemical substrates from our system. These characteristics also make beets an ideal supportive therapy for conditions involving liver disease and fatty liver. 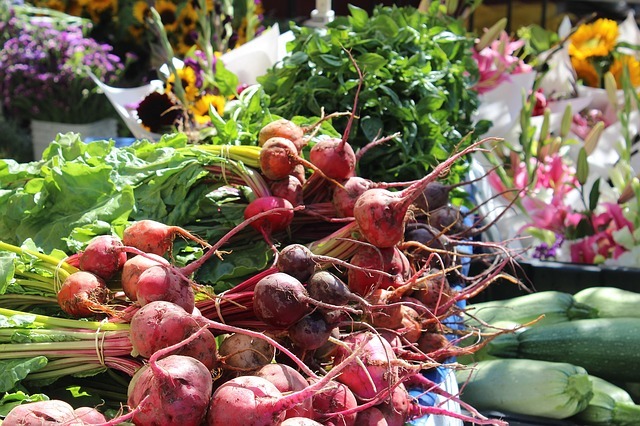 There are more to beets then just the root, beet greens are nutrient rich containing magnesium, potassium and calcium. They are also an excellent source of anti-oxidants, vitamin A, vitamin C, lutein and zeaxanthin. Lutein and zeaxanthin are carotenoids, which concentrate in the eye and protect it from light-induced damage and can decrease the risk of cataracts. Keep in mind that consuming beets may cause beeturia, or the reddening of the urine after consuming beets, which can be mistaken for hematuria, or blood in the urine. Beeturia is harmless but can signal that an underlying imbalance may be present. Beeturia is more prominent in individuals with iron deficiency, iron excess, or issue with iron metabolism. Beet greens also contain oxalates and for individuals with existing or untreated kidney or gallbladder issues they may want to limit intake. Preheat oven to 375°F. Cover beets with parchment paper and roast until tender when pierced with a fork (approximately 1 hour). Heat oil in a medium Dutch oven over medium-high heat, add leeks, onion, and celery and cook until translucent. Add garlic, ginger, thyme and cook until fragrant. Add beets and broth and bring to a boil, reduce heat and simmer until vegetables are tender, about 25 minutes. (Remove thyme sprigs if used.) Add coconut milk and puree soup (this can be done using emersion blender or blender which can process hot liquids). Salt and pepper to taste. Garnish with fresh parsley if desired and serve while warm. Enjoy! Alexandria Nguyen-Johnson is a licensed naturopathic physician and Chinese medicine practitioner. She is trained in primary care and focuses on women’s health, pediatrics, chronic conditions, family planning and reproductive health. Call Heart Spring Health at 503-956-9396 to make an appointment. This entry was posted in Naturopathic Physicians, Portland Natural Medicine, Recipes and tagged natural medical care portland, Naturopathic Medicine Portland, portland natural medicine, portland naturopathic clinic, Portland nautropath.